International Astronautical Federation President Berndt Feuerbacher presents the IAF's 60th Anniversary Award to General William Shelton, Commander, Air Force Space Command, during the International Astronautical Congress in Cape Town, South Africa, on October 4, 2011.
by Staff Sgt. Richard A. Williams Jr.
10/5/2011 - ARLINGTON, Va. (AFNS) -- The Air Force Global Positioning System program was recognized Oct. 4 by officials at the International Astronautical Federation with a special award during the 62nd International Astronautical Congress in Cape Town, South Africa. The IAF, which celebrates its 60th anniversary this year, established a one-time 60th anniversary award to honor the occasion and "recognize an organization or key individual for a singular and successful project in the field of space applications, space science and exploration, which could demonstrate through its implementation, that measurable benefit to humanity has been achieved," according to the IAF website. 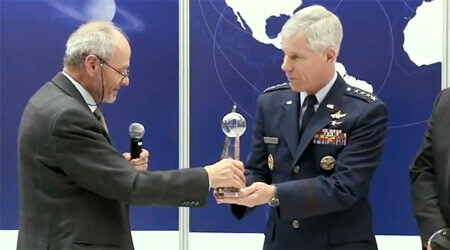 Gen. William L. Shelton, the Air Force Space Command commander, accepted the award in Cape Town on behalf of the Air Force. "This is a tremendous honor for the Air Force, Air Force Space Command and everyone on our GPS team," said Under Secretary of the Air Force Erin Conaton. "We are proud to have developed and invested in this remarkable system that our Airmen continue to operate, sustain and modernize for the benefit of billions of people. "In addition to being a vital asset for our military and our nation, GPS is an international treasure that enables countless economic transactions," she said. "Its contributions to the global economy are enormous -- by one estimate more than $100 billion every year." GPS is a space-based radio-positioning system that provides precision navigation and timing information to military and civilian users worldwide, officials said. Since its origin more than 30 years ago, GPS has evolved into an indispensable resource that enables technologies employed by users every day in a variety of government and private sectors, to include agriculture, banking, transportation, weather, and defense. In its official award nomination package to the IAF, the American Institute of Aeronautics and Astronautics stated, "No other single space product, program or system has led to human benefits that are even remotely close to those that have resulted from GPS."